Hello. Ryuken here. I've gone from Broad/Proficient to eventually obtaining Ultimate and now #1 experience on Obsidian so... I would like to think that I have learnt enough to shed some light on this puzzle that most people deplore. Here's hoping it helps you. - Goal: Put Crystal Clear (CC) chains into the keg. Nothing else. - Basic, Skilled and Expert sections (arbitrarily defined by me). Ideally you'd stay in that section until you've mastered the techniques and hit the consistent CC chain average of the next section before moving on. More importantly anyway, practise each technique before expecting to be able to calculate and execute it when the situation arises. - CTRL+F Index for the Movement and Planning bits. Save your Whites so you don't burn anything. Ideally, you'd repeat this over and over, only sending Junk into the furnace thereby conserving Whites for the CC chain that we're after. Not much to be said. 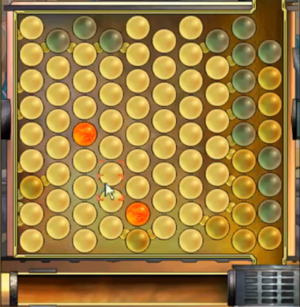 The connecting mini-bubbles show you available moves. White climbs into Black and falls into Brown, etc. It'll become second nature with time. A piece with more legal moves has more value. Please click-drag instead of click-click or keyboard. No exceptions. A common beginner-level mistake here is not dragging pieces in a straight line. Just practise more, I can't really help you there sorry. C) Dachimpy's simulator is noteworthy, but without the time factor you won't progress much. Definitely use it while you're learning movement, but the earlier you break away from it, the better. Suffer through the puzzle once you've learnt movement. Pressure makes diamonds. Crawling - Movement of 2 distinct pieces through a 3rd medium. Eg: At mid/end game, High Browns and low Blacks are problematic because they have no value in a sea of Whites. Crawling offers a simple solution by trading value between both Junk pieces, using one to carry the other. Black climbs into Brown to +1 value then falls into White to -1. Brown does the opposite, repeat. Once comfortable, crawling can be performed in any desired angle through a strategic mix of both horizontal and vertical crawls. As it requires a medium (sea of Whites in this example), you'd find little use for it in the earlygame. Nonetheless crawling is a tool at your disposal when the need arises. Learn to do it fast, it is SO useful. - Your focus at this stage is merely the Whites, all the other Junk is irrelevant. It's intuitive to work from the Right and save the most immediate White. - Pick a friendly starting board. In the rightmost 3 columns, look for 5 Whites or less. Immediately abandon any other board (no penalty). This is especially helpful when movement calibre is poor and thought process is slow. No shame in doing so. Objective: More efficient planning and execution than Basic. Spice Knowledge + Early detection of problematic pieces. Rows (aka Trains) - Moving rows of piece A using 1 piece B through medium C.
Over time, you'd find that Crawling alone isn't sufficient. We cannot always have 1 Black to carry 1 Brown, etc. Moving rows maximises the utility of the value piece by carrying a chain of problematic pieces. At this stage I just wish to point out something. If you caught on, the way i maneuvered the Brown row and the Black row were different. Apart from demonstrating how to move rows, this illustrates examples of good and bad rowing. Notice how none of the Browns were clicked when moving the Brown row? If I clicked the Brown, a simple over-movement would cause it to slide too far and ruin the row; it is safer to drag a White because it cannot slide inappropriately regardless how poorly I flick my cursor. The Black row is the bad example. I meant to illustrate a Spice example but as it turns out there's multiple things going on here so let's review it chronologically. 3)	Instead of replacing the most immediate White column, I flush the Blacks behind the Spice. It's a pre-emptive measure: It would be impossible to get behind the spice wall if it was at the end of the board, so I'd rather deal with it now. In the same way, flush Browns behind a spice wall that's at the top. Your best course of action is to drown the Trap. Never opt to send up a Trap, that wastes 7-8 Whites which is complete blasphemy in Distilling. It's a good habit to store a few value pieces (Blacks at top, Browns below). This allows for easy manipulation when the spawn column gives problematic pieces like these 2 Blacks. There's no rush to move these value pieces into the last column unless you desperately need to save a White from burning, so keep them where they are. Perhaps you didn't keep enough value pieces, or simply none spawned. Performing a Rescue involves pulling pieces from the Junk pile on the right to extract a stuck problematic piece. Technically one Black piece here would've been enough to get them out, but I like to match the 3 Browns with an equal 3 Black, for aesthetics. - Don't overdo the Keeping Value Pieces unless you're comfortable with it - 2 is usually sufficient. One for moving a row and one for backup. - If you're still in the starting bits of the Midgame, you can afford to ignore one or two problematic pieces. There's a good chance the spawn can pick them up. But don't do this for too long! Accelerated Crawling - Combination of Crawling and Keeping Value Pieces. But how do we set it up? Sorry I don't have an eloquent way of explaining this. In essence, if a value piece spawns at the very edge, don't touch it. Alternatively, you can crawl on the edge and create your own value piece to set up the acc.crawl, as illustrated. On hindsight, I had enough time to rescue the other Black too, but I couldn't calculate that in time. What if the fresh spawn had insufficient Junk? Retract the Junk from the last column. For the most part, you only need to tidy up the first column of Junk. Tidying up involves ensuring every Junk single piece has value. This way, you can always retract them instead of sending up a bad column. More importantly however, they can dive back into the action and help out with misclicks/spices/anything in the middle. But BE VERY CAREFUL with this! Tidying the right side significantly improves your gameplay by opening up more options, but tendency for PureBrown increases towards the end. Stay alert. Avoiding the PureBrown again. Since "Black>White" condition is not fulfilled, PureBrown columns goes up and tarnishes your clean Keg. During the midgame, it's possible to be engrossed in the action and overlook the Junk pile on the right. Tipping each Junk column with a Black safeguards against PureBrowns as those Blacks are in deadlock. The earlier you establish your columns' Black tips, the quicker you establish safety. Here, after moving the White-spawn up, I noticed there was no easy way to fill the 3 remaining gaps. I did however have somewhat of a Brown passage for Whites to flow through, so I Instead moved the gaps towards the Brown passage. - Tidying up additional columns with your excess time in the earlygame would allow more time during your midgame to do other operations - not a bad idea but only do this with excess time. Organising additional columns of Junk should not be a priority if your board has other problems. - I refuse to write anything regarding endgame structure patterns because I don't believe it offers enough I have grown fond of a particular structure, somewhat. See Q&A . But experiment to see what works out for you, if you insist on having one. - In the endgame, stuck Whites must be rescued immediately as every White counts. Connect more Whites to it and fish out the entire row at once. Borrow a White from an organised CC if you must. - Fill in the CCs diligently (thanks Galam). I'm not sure why but I fail at this far too often. The next CC isn't fully constructed and I place Whites at the next column. I have no idea sometimes - just don't do it. It's not hard to fix even after the error is committed but why go through all that. 1)	Abandon your puzzle. This is arguably the most important takeaway if you're not already doing it. Do your best CC chain that you can pull off, and leave the puzzle immediately. Unless it's a CC12+, abandon. You'll see the results after a few sessions. 3)	Playing from Left to Right in the earlygame. Instead of rescuing Whites from the right, one could instead focus on the Junk from the left and eradicate problematic pieces right from the get go. This does strain the nerves a bit as Whites would be close to the Furnace for a while but it makes the midgame a bit easier. Somewhat of a tactical gambit if you're confident in your piece movement. 5)	Pick your starting board based on Spice count. This is for when you're at the Leg/Ult level as it seems to be a very minor effect. All spices from your starting board would burn away, and every Wasted Spice deducts from your score. Pretty self-explanatory. Nonetheless putting the score-argument aside, why would you want to play on a board that starts with 7 Spices anyway? This occurs when you hold a piece and literally fling it the moment a Furnace occurs (regardless automatic or triggered). You get to watch an amazing slow-mo and your piece is stripped of all its legal moves. Solution: Bring a piece near the glitch. This poses somewhat as salient stimuli which causes a graphical update which "refreshes" the piece. Being aware helps maintain composure and solve the glitch with ease. 1) How do I set up accelerated crawling in the first place? Added. 2) Not enough value pieces are spawning for me to even keep. Added. 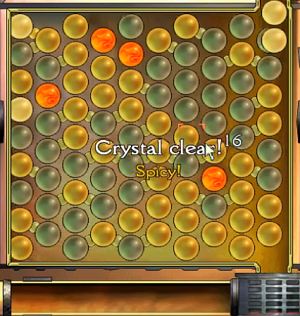 3) What those random spices in the middle of the board that block row movement. A blend of rowing and crawling would surmount most isolated spices, as shown. Alternatively, I could've just moved the row by bringing the Black underneath instead of over it, but it didn't occur to me at the time. Regardless, no special movement is required for an isolated spice. Hope this illustration helps establish that. 4) I like to do (image), have you considered this endgame structure? Why do you feel endgame structures don't offer enough? Some of the structures you guys have shown me are rather interesting as well, just be mindful that you can handle whitespawns at the extreme corners. 5) Why abandon a board with >5 Whites? It's more for beginners. As you progress, abandon boards with multiple spices. Further up, look for boards without multiple spices and with LOTS of whites. The latter reduces the probability of more spices spawning since your CC Chain would start earlier. That's about it for this write-up for now. There's a lot more that can be said and demonstrated but these would cover the main bulk of things. At the very least, hope this gives you the motivation to give Distilling another shot. 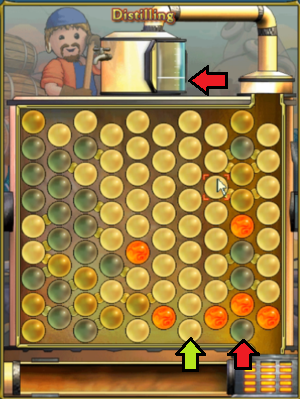 This is a detailed and comprehensive post on what I consider to be the most clever and most under-rated puzzle in the game. Thank you! Appreciate the kind words! It is indeed a terribly underrated puzzle. Been receiving /tells in game and PMs via the forums, some of which are very aged (I am so sorry I didn't even know they were a thing, overlooked the inbox notification somehow). I take it that they would like to remain anonymous so I've just taken the general issues raised and addressed them accordingly. There were many repeats and I hope I didn't overgeneralise. Also added more, in general. Merry X'mas! 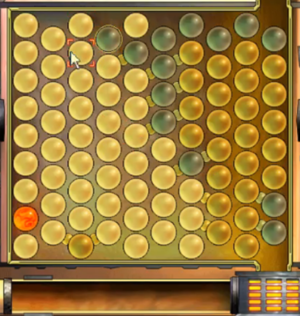 Just one question: although I've been a quite active player back in the days, I've never really bothered about high-scoring techniques and tricks, in Distilling or any other puzzles. Could you elaborate a bit more about this part? If I get only a CC10 or CC11, is it better to leave the puzzle after getting the last CC, than to send down the last row and wait for the DR? Yes. If I remember it right, it's because your score is based on the average of rows you send instead of total score? Any CC6+ -> Abandon is better than finishing the session. You have to send up one BIG row with whites and spices. There is no real average of rows. Abandon CC6+ gives a small plus for lower levels, up to master level. If you go for real high levels like leg/ult on elite oceans, these small plus is not important because you have to play CC12+. Empirical evidence is consistent with this idea, and I pretty much just accepted Dismissing as the way to go. I've recently learnt of the underlying rationale however, which is briefly summarised by Pat above. Turns out Dismissing isn't always correct. CC1 column = 1point, CC2 column = 2points, etc. So yes pat is correct, CC6+ -> Dismiss is better. Note: criticising the model, it's more likely that the scores increase, increasingly. A Vegas scores significantly better than a Donkey, whereas a Triple does little more than a Double. Hence the point gain from CC5 to CC6 should intuitively be higher than CC2 to CC3. Nonetheless, applying an exponential model to the points reaches the same conclusion pat outlined. This does point to something else however - a small flaw in what I initially wrote. 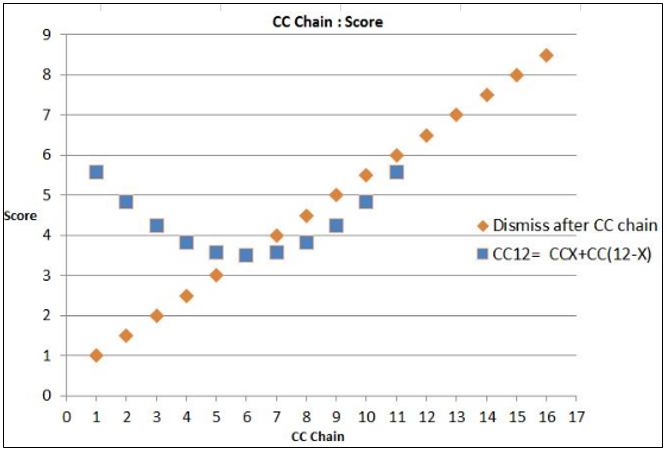 Always abandoning after the first chain is wrong: a CC3 should definitely be followed up with a CC9 (eg. Spice Trap forced a CC3). But if a Trap forces a CC5... then it's complicated. You'll have to weigh the score boost against the factors above. I see, thanks a lot for the explanation! I'm trying to help out my hearty, after a long (years) absence, by providing Expert labor. I'm on Cerulean. Can anyone give me some pointers on how to get there? Do I want to be aiming to improve ranking (i.e. getting CC6+ and then quitting), or aiming to get Excellent in my duty reports, or what? What does it even take to get Excellent these days? So if I get to cc^11 without enough whites to finish a cc^12, it?s actually better for my score to abandon puzzle at the end of the cc^11 instead of waiting to create the last full run of white? Yes, exactly. This applies to any CC6 or higher. Hmm I can't speak for Cerulean because my entire journey from Able to #1 Distiller has been on Obsidian. The best move I suggest would be to Chain->Dismiss until you get Ren, and let the badge give Expert on your behalf. Lovely! And to raise or drop my standing I do not need a duty report correct? As long as I have recorded time playing the puzzle, each session counts? In terms of your Standing, as long as you have touched any piece or if 1 Furnace has activated, the session is counted and yes you'll go up/down accordingly. Practised moving Whites over because I always want to get the most out of each session. It doesn't count for anything but I'd encourage it on a why-not basis. That's about what I figured. I shouldn't chain -> dismiss until I can get CC6+, though, right? Yup this requires distillers to pull off CC6+. Unfortunately if 6+ is out of reach then abandoning doesn't help, even potentially worse for your stat. But at that stage the priority should be learning the puzzle instead of executing for the Ren rank anyway. I think it does. Thanks! Interesting. Personally I kill all my advanced labour rather quickly so I've never really took note whether every single session gets paid. But I don't recall not getting paid for any CC12+. If you don't send up at least 12 rows you haven't "finished the puzzle" and therefore don't get paid when abandoning. Welp I can't edit the original post anymore because "You cannot edit a post which is older than 60 days." Someone suggested I remake the thread so it can be continually updated but I've mixed feelings about that. Anyway, further Q&A for what I've been asked, only doing the generic ones as mentioned previously sorry. Would be way too long otherwise. You said generating a burn isn't worth it based on the numbers. But what if I generated a burn by burning 1 White in 2 different columns? I've entertained that thought a bit. I think statistically yes you can but how would you pull that off? If I've burnt 1 White I doubt I'd have enough Junk to burn another 1 White. Intentionally burning a White because you foresee having to burn 2 Whites later.. well okay if you want to gamble. Could you address the point about how abandoning only helps until Master? Not true. See Clip 1. 6 Feb 2018, YeBloodyBoundingMain Arch on Obsidian. Variations of the question: Do you abandon CC10/11/12/13/14/15/16, does that improve rank or just prevents dropping? Sidenote: 1 variation of this question included Experience into the mix. Odd but anyway, I've brought my alt Ryugun to Neo/Leg via only abandoning (I took one DR hence the Neophyte because i wanted incred distil trophy) and Clip 1 is Ryuken at Sublime. So that should answer that. Variations of the question: Any tips to help me play faster? To me there's 2 parts to "playing faster". Accuracy & Calculation Speed. - Accuracy: In an attempt to say more than "make friends with your mouse", see Clip 2 for one of my warmup habits - Inefficient multiple clicks. It's just what I like to do, maybe that would help you? - C. Speed: Comes with time. I feel it helps to have some degree of pressure to force yourself to develop calculation speed. Try what I did in the beginning of Clip 1. Send as many CC before you play the endgame, to the point where it's borderline uncomfortable. Your endgame will demand more rapid calculation and less 'autopiloting' that way. - Sidenote: I like "wiggling" too. See Clip 3. Moved the browns perfectly but White got jammed. I prefer just wiggling instead of re-clicking the White. Sometimes I just can't draw straight lines properly so yeah wiggle. Should I still be tidying the right side when there's only 1-2 Junk columns left? Can't move browns and blacks through each other as easily anymore. Hope that helps. Always nice to hear from people who are growing to appreciate the puzzle. Umm I'm not sure what that means. If you could clip it happening that'd be informative! I've had a couple games end prematurely after a CC11, but honestly I assumed I wasn't paying close attention and screwed up something at the start of the CC chain (its not uncommon for me to mess up the first column when trying to push my self and failing). I'll keep an eye out, maybe I encountered this bug without noticing! Its randomly brown/black rows you send up without whites and with spices in them, it randomly goes spicy! sometimes which counts as a row which it should not happen at all. So therefore your correct it is a bug. After recording my sessions a few times, I managed to catch one of this premature CC11 finishes. As I had originally assumed, it was me not paying close attention and sending a full brown column up. Because I got no sound indication for it (as opposed to a blecch! ), I didn't notice when it went up. No bug here on my end then, is it possible the same is happening to you @hidemyhoney? 1) Black Tips. Make it a habit. 2) When you start a board, the rightmost column is always full Black. Take advantage of that, retrieve those Blacks instead of burning them. The chances of purebrowns occurring are lowered significantly.